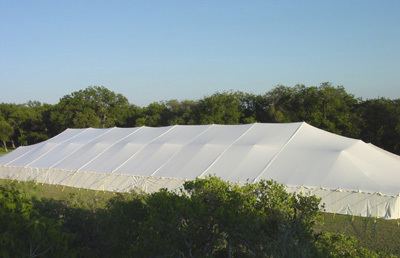 This Premier Ultimate Party Tent is fully functional to make your party or event a success, and can handle multiple set ups and take downs as well as both commercial and industrial use. This party tent kit includes tent top with guy ropes, galvanized side poles, center poles, quarter poles, tent stakes, and installation video. Strengthened with 2 in. seatbelt webbing on the entire perimeter, the side poles are light weight and extremely durable, and the center and quarter poles have a plate welded on the top and bottom, and a heavy duty pin welded into the top.